Many of the plants in San Diego are not native. Drought-resistant shrubs and low vegetation of chaparral. Like much of southern California, the majority of San Diego County was originally covered with coastal sage scrub and chaparral in the eastern portions. Chaparral (from a Mexican word for scrub oak, chaparro, meaning “shorty”), is the most common plant community in San Diego – as typical of the area as pine forests are of the mountains. Chaparral is composed of drought-resistant shrubs and low growing vegetation, generally shorter than 8 feet tall. The environment is very hot and dry in summer and mild in winter; drought and fires are common. 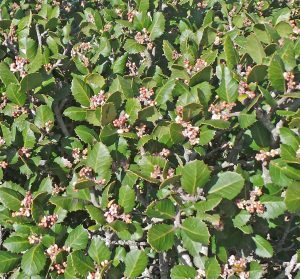 The tough evergreen plants of the chaparral are adapted to these conditions, and most have small or leathery leaves, store water in their leaves or deep roots, go dormant in the summer, and take advantage of the slightest rainfall to bloom and produce seeds. Southern California’s coastline, now largely developed, was once covered by coastal sage scrub. It was composed of woody shrubs ranging from one to ten feet, typically California sagebrush, white and black sage, California buckwheat, toyon, and lemonade berry. 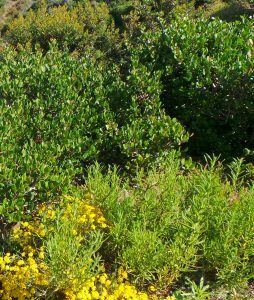 Like the chaparral plants, coastal sage scrub is both drought and fire-adapted. Coastal sage scrub now exists only in fragmented remnant habitats. In addition to the dominant shrubs in both coastal and inland areas, there are many smaller blooming annuals and perennials that are rarely seen unless hiking in natural areas. Native plants beach evening primrose, Camisonia cherianthifolia (L), coast monkey flower, Diplacus puniceus (formerly Mimulus aurantiacus) (LC), yellow mariposa lily, Calochortus weedii (C), wishbone bush, Mirabilis laevis var. crassifolia (RC), and matilija poppy, Romneya coulteri (R). Blooming California lilac, Ceanothus sp. 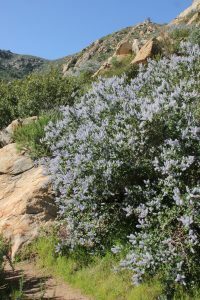 One of the best places to see native plants in San Diego is at Mission Trails Regional Park, but there are also many other public and private tracts of land in the county that have native chaparral. The native chaparral vegetation has been preserved in official nature preserves such as Los Peñasquitos Canyon Preserve and in other canyons including Switzer Canyon, Tecolote Canyon Natural Park, and Marian Bear Memorial Park in San Clemente Canyon that have escaped development because of the steep topography. Docents of the San Diego Natural History Museum lead walks in Florida Canyon (across from the Zoo parking lot) at certain times. Native lemonade berry, Rhus integrifolia, in flower. The 2000-acre Torrey Pines State Natural Reserve is an wilderness island in an urban sea, with lots of chaparral as well as the elegant Torrey pine (Pinus torreyana torreyana), the rarest pine in the United States (it only occurs naturally near Del Mar and on Santa Rosa, the second largest of the Channel Islands off the coast of Santa Barbara). Hikers can follow 8 miles of trails through stands of wind-sculpted pines and other plant communities including coastal strand, coastal scrub, salt marsh, fresh water marsh and riparian on this reserve featuring high broken cliffs and deep ravines on headlands overlooking the ocean. Cabrillo National Monument, at the tip of Point Loma, has native coastal sage scrub habitat along the Bayside Trail and many labeled specimens in the beds around the visitor center. (The superb view of San Diego’s harbor and downtown skyline framed by the Cuyamaca mountains, the Old Point Loma Lighthouse, and in the winter, migrating gray whales, are other reasons to visit). Torrey pines, PInus torreyana torreyana (L), coastal scrub at Cabrillo National Monument (LC, RC) and looking across the bay at downtown San Diego from the Monument Visitor Center. Native chaparral at Mission Trails Regional Park. 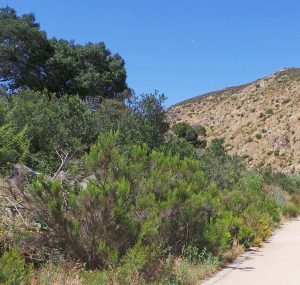 Mission Trails Regional Park encompasses 7,220 acres of both natural and developed recreational areas. About 5,800 acres of rugged hills, valleys and open areas show what the area looked like before the arrival of the Spanish. Most of San Diego County was once covered with chaparral (from a Mexican word for scrub oak, chaparro, meaning “shorty”), the most common plant community in this area. Chaparral is composed of shrubs and low growing vegetation, generally shorter than 8 feet tall. The environment is very hot and dry in summer and mild in winter; drought and fires are common. The tough evergreen plants of the chaparral are adapted to these conditions, and most have small or leathery leaves, store water in their leaves or deep roots, go dormant in the summer, and take advantage of the slightest rainfall to bloom and produce seeds. 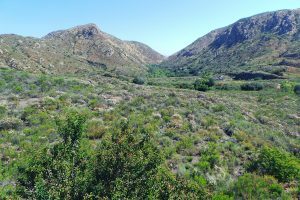 In addition to the chaparral, there are also woodland, coastal sage, and riparian habitats and plant communities of California native plants. Started in 1974, Mission Trails Regional Park has become one of the largest urban parks in the United States. The Visitor and Interpretive Center includes a number of exhibits, a library, a 93-seat theater, and an art gallery. There are many trails in the park, including the Oak Grove Trail leads from the Visitor Center to a small oak woodland with majestic coast live oaks and rare Engelmann oaks and the Visitor Center Loop Trail that goes through coastal sage scrub, chaparral, and riparian woodland habitats. The most popular trail of the park is the Cowles Mountain trail, which goes to the summit for a 360-degree panorama of San Diego County. Another popular stop is the Old Mission Dam, which was built to supply irrigation water to farm land that supplied food for the Mission San Diego de Alcala. Native plants bush sunflower, Encelia californica (L) and chaparral broom, Baccharis sarothroides (LC), the San Diego River along Oak Canyon Trail (RC) and Old Mission Dam (R) at Mission Trails Regional Park. However, most people aren’t that impressed with the grey-green vegetation on the hillsides. 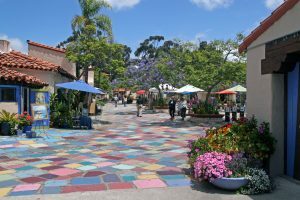 The San Diego area has a very mild, Mediterranean-type climate characterized by hot, dry summers and mild, wet winters. The area receives an average of only 10” of rainfall annually right along the coast, 12-15” in the interior valleys and foothills, and up to 40” in the mountains. 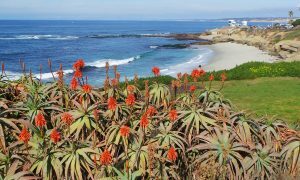 Early residents quickly realized they could easily grow more showy plants from similar climates throughout the world, and introduced many of the trees, shrubs, and flowers that people often associate with southern California. Various types of palms came from around the world to join the few native species. From South Africa came the orange-flowered bird-of-paradise (Strelitzia reginae), various types of succulent ice plants (several genera in the Aizoaceae family, formerly the Mesembryanthemaceae) commonly used as ground covers, African daisy (Arctotis and others), jade plant and aloes that flower in the winter. Ornamental plants introduced from Africa include bird of paradise, Strelitzia reginae (L), ice plant, Lampranthus sp. or hybrid (LC), ‘Sticks on Fire’ milkbush, Euphorbia tirucalli (C), red African daisy (RC) and blooming aloe (R). Tall, spire-like Italian cypress, rosemary, and olives were imported from southern Europe around the Mediterranean Sea, as well as echiums and aeoniums from North Africa near the Mediterranean, while oleander came from the Middle East. Some of the many plants introduced from southern Europe include Italian cypress (L), olives (LC), and oleander (C). Echiums (RC) and aeoniums (R) came from the Canary Islands and North Africa. Eucalyptus trees and bottlebrush (Callistemon) were brought from Australia, while New Zealand flax (Phormium) and New Zealand tea tree (Leptospermum scoparium) came from that island country. Bottlebrush (L) and various species of eucalyptus (LC, RC) were brought from Australia, while New Zealand flax (R) comes from that country. California pepper (L) really is native to Peru; bougainvillea (LC) and jacaranda (RC) are from Brazil, and pampas grass (R) comes from southern South America. Ornamental plants introduced from China and other parts of Asia include Chinese hibiscus (L), camellias (LC), heavenly bamboo (RC) and sago palm (R). Indian hawthorn in bloom (L) was introduced from Asia, and a hybrid agave (LC), the soft-leaved Agave attenuata (RC) and Mexican bush sage, Salvia leucantha (R), came from Mexico. You don’t have to go far to see these exotic plants from around the world. Drive through most residential areas, and you’ll be treated to views of interesting plants and colorful flowers blooming almost any time of the year. Suburban commercial properties, such as shopping centers and churches, will also often have landscaping that isn’t just green grass or plain rocks. 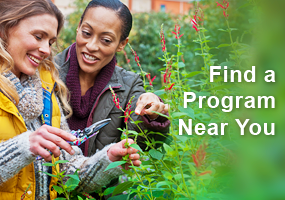 And of course there are many parks, gardens and other special sites to see a variety of plants; these are just a few of the many possibilities to see great plants in San Diego County. The North Fountain in Balboa Park’s Plaza de Panama and some of the buildings along El Prado. 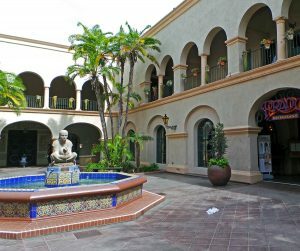 Spanish Village Art Center is one of many venues in Balboa Park. 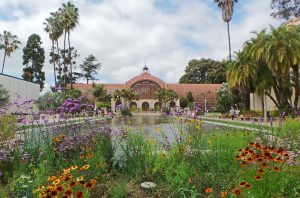 Balboa Park is a 1200-acre urban park of rolling hills and canyons with 15 museums, theaters, gardens, walking paths, sporting arenas, an organ pavilion, international cottages, the Zoo and more named for the Spanish maritime explorer Vasco Núñez de Balboa. In 1868 city planners set aside 1,400 acres of scrub-filled “wasteland” and declared it the site of a future city park. In the early part of the 20th century, San Diego hosted two World’s Fairs on the site: the Panama-California Exposition in 1915 and the California Pacific International Exposition in 1935. Many of the Spanish/Baroque-style buildings that were erected along the “Prado”, the main walkway, for those expositions remain as central features of the park (despite being intended to be temporary), surrounded by lush gardens and landscaping. When they fell into disrepair, most were eventually rebuilt, using castings of the original façades to retain the architectural style. The menagerie of exotic animals at the 1915 Expo provided the basis for the San Diego Zoo. The park and its historic Exposition buildings were declared a National Historic Landmark and National Historic Landmark District in 1977, and placed on the National Register of Historic Places. 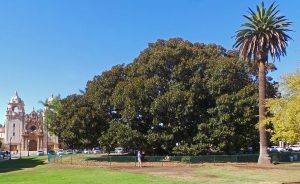 The huge Moreton Bay fig, Ficus macrophylla, near the Natural History Museum. Tiled Moorish fountain in the Alcazar Garden with the iconic California Tower at the San Diego Museum of Man beyond. Alcazar Garden. Patterned after the gardens of Alcazar Castle in Seville, Spain, this formal garden planted with 7,000 annuals bordered by boxwood hedges, is known for its ornate fountains, exquisite turquoise blue, yellow, and green Moorish tiles and shady pergola. It has been reconstructed to replicate the 1935 design by San Diego architect Richard Requa. 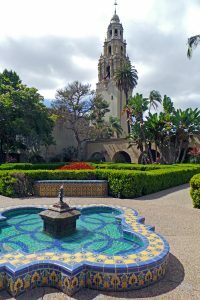 The view of the California Tower from Alcazar Garden is one of Balboa Park’s most iconic shots. The wooden lath Botanical Building across the Reflecting Pool. Botanical Building and Reflecting Pool. Built for the 1915 Exposition, along with the adjacent Lily Pond and Lagoon, the historic building is one of the largest wood lath structures in the world. The plantings in the 250 ft long by 75 ft wide and 60 ft tall Botanical Building include more than 2,100 permanent plants, with collections of cycads, ferns, orchids, other tropical plants and palms as well as changing seasonal flower displays. The 193 by 43 foot pond and smaller companion pool were originally referred to as Las Lagunas de las Flores (The Lakes of the Flowers) and were designed as aquatic gardens. The pools contain exotic water lilies and lotus which bloom spring through fall. The view of the Lily Pond with the Botanical Building in the background is one of the most photographed scenes in Balboa Park. The “Woman of Tehuantepec” fountain sculpture in the plaza garden of the House of Hospitality. Casa del Rey Moro Garden. The design for the “House of the Moorish King” garden, created by Richard Requa for the 1935 California Pacific International Exposition, was influenced by the Moorish gardens of Ronda, Spain. The garden and surrounding building, the House of Hospitality, were extensively renovated in the late 1990’s, and includes a replica of the wishing well in the Guadalajara Museum of Gardens. The building surrounds a plaza garden with a fountain sculpture “Woman of Tehuantepec” cradling a water-spouting olla. Desert Garden. This 2.5 acre planting of succulents and drought-resistant plants from around the world was established at this location (across the footbridge that crosses Park Boulevard near the Natural History Museum) in 1976. It contains more than 1,300 plants which are interesting at any time of year because of their unusual shapes, although the peak blooming period is January through March. The 1935 (Old) Cactus Garden was developed under the direction of Kate Sessions for the 1935 California Pacific International Exposition. It has some of the largest cactus and succulent specimens in the Park and has also been developed to include African and Australian protea plants. Succulents and other plants from arid regions of the world line the paths through the Desert Garden. Inez Grant Parker Memorial Rose Garden. This three acre site just south of the Desert Garden — which was named an Outstanding Rose Garden in the US by All-America Rose Selections in 1978; received an Award of Excellence in 2003 from the World Federation of Rose Societies; and in 2014 was named to the Great Rosarians of the World Hall of Fame — displays 1,600 plants of more than 130 rose varieties that are usually at their peak bloom in April and May. New varieties are introduced each year. The Rose Garden (L) includes a cooling fountain (C) and numerous cultivars of roses (R). Japanese Friendship Garden. This expression of friendship between San Diego and its sister city, Yokohama, creates an immersive experience into Japanese culture. San-Kei-En (“three scene garden,”) represents the concepts of Water, Pastoral, and Mountain. The 12-acre Garden’s design is based on centuries-old Japanese garden concepts and symbolism adapted to San Diego’s climate and the plants that can be grown here. It includes a small entry plaza, koi pond, stone arrangements, a bonsai collection, a traditional sand and stone garden, strolling paths, a grove of 200 cherry trees, Inamori Pavilion and a 60 foot long fujidana (wisteria arbor) viewing area overlooking the canyon below. The unique setting, water features, sukiya-style buildings and landscape seeks to foster a relationship between humans and nature, through Japanese simplicity, serenity, and aestheticism. The Japanese Friendship Garden offers traditional design concepts using plants adapted to the local climate. Palm Canyon. This tropical oasis located south of the House of Charm has 58 species of palms, large magnolia trees and a huge Moreton Bay fig tree along the winding paths within its 2 lush, shady acres. The original group of Mexican fan palms date back to the early 1900s. A wooden footbridge and stairway provide access to the canyon. Zoro Garden. This small, sunken garden with stone walls located between the Reuben H. Fleet Science Center and the Casa de Balboa is planted as a butterfly garden, with both nectar plants and larval host plants. 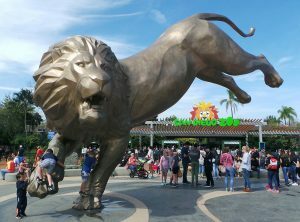 Rex the Lion sculpture at the entrance to the San Diego Zoo. Both of these popular attractions are accredited botanical gardens, despite their primary emphasis on animals. 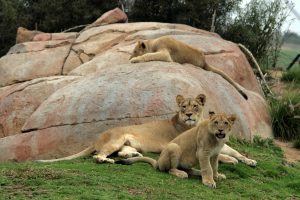 The 100-acre Zoo has been accredited since 1993 as a botanical garden with more than 4,500 species of plants from habitats around the world in addition to its 4,000 animals. Naturalistic animal exhibits are heavily planted to resemble the animals’ native habitats where possible. The flamingo enclosure is planted with many plants from the bird’s habitat. Many of the leaves and flowers that animals eat and use as habitat enrichment, such as bamboo, eucalyptus, acacia, Ficus (fig) and hibiscus, are raised especially for that purpose on the grounds or browse farms and gardens. Many of the plants are rare in botanical collections. The Zoo maintains eight accredited plant collections, including bamboo, orchid, cycads, fig trees, palms, and coral trees (Erythrina). 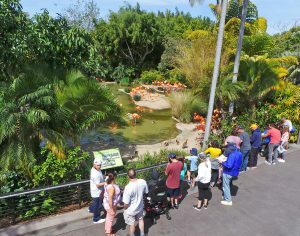 The Zoo offers a variety of self-guided Botanical Walking Tours (printable tour brochures at http://zoo.sandiegozoo.org/visitor-info/botanical-tours). The Safari Park showcases animals in naturalistic environments where possible. An offshoot of the San Diego Zoo in the San Pasqual Valley of San Diego County 30 miles north of downtown, the Safari Park is an 1,800 acre “natural environment” focused on the conservation and preservation of rare and endangered species, with more than 3,000 animals representing more than 300 species. The Journey into Africa Tour takes visitors on trams into the open plains where grazing animals roam freely interacting with other animals (carnivores are kept separately). 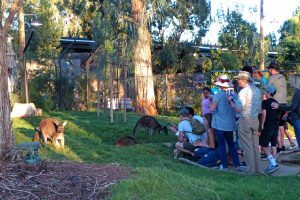 The Safari Park is also home to many unusual plants for the benefit of the animals and visitors alike, with a diverse and extensive botanical collection representing 3,500 species and 1.75 million specimens. Over half of the Park’s land has been set aside as protected native species habitat. There are three accredited garden collections—the Baja Garden, California Nativescapes Garden, and the Nicholas T. Mirov Conifer Arboretum. These and many other specialized gardens (herb, bonsai, epiphyllums (epiphytic cactus), protea, etc.) 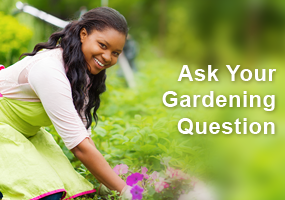 are maintained with the help of dedicated volunteer gardeners. Kangaroo Walk in the Walkabout Australia exhibit. The Conifer Forest displays more than 1,000 plants representing 400 species on over 25 acres set along man-made streams and trails. Their North African cypress is one of only 12 left in the world. And the new Walkabout Australia exhibit showcases plants (and animals) from that southern continent. The Baja Garden, with rare plants collected in Mexico more than thirty years ago with special permits that are no longer available, includes more than 200 whimsical boojum trees (Fouquieria columnaris), many types of cactus, elephant trees (Bursera microphylla), agaves, yuccas, and palms. The Baja Garden (L) displays plants from this arid peninsula in Mexico including cactus, agaves and boojum (R). The Old World Succulent Garden focuses on plants primarily from southern Africa and the Middle East and includes cycads, euphorbias, and a great selection of aloes in a variety of sizes, from 30-foot, multiple-headed trees to tiny plants with rosettes only an inch across. The Old World Succulent Garden (L) has many unusual plants from southern Africa and the Middle East including cycads (front left of center photo), tree euphorbias (back right of center photo) and short and tree aloes (R). 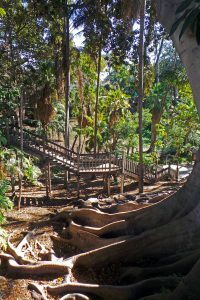 The California Nativescapes Garden has more than 1,500 individual plants representing 500 species, showing plant communities of chaparral, coastal sage scrub, cypress, desert transition, high desert, island, low desert, montane, palm oasis, and riparian. The California Nativescapes Garden (L) includes plants from mountain areas (LC), riverine environments (RC) and many native palms (R). The San Diego Botanical Gardens, formerly Quail Botanical Gardens, is a 37 acre garden featuring numerous exhibits, including rare bamboo groves, desert gardens, a tropical rainforest, California native plants, Mediterranean climate landscapes, succulent gardens, an herb garden, firesafe landscaping, a subtropical fruit garden, and native coastal sage natural areas. Until 1957 the gardens were the private estate of Ruth Baird Larabee, at which time she donated her house and grounds to the County of San Diego. A Foundation was established in 1961 to display plants from regions of the world that have a climate similar to Southern California’s, and for the conservation of rare and endangered plants. The New World Desert Garden near the entrance (L), the California Natives Garden (C) and in the Hamilton Children’s Garden (R) at the San Diego Botanical Gardens. Today the gardens include nearly 3,000 varieties of tropical, subtropical, and California native plants. Collections include the climate-based gardens for the New World Desert (with a Baja California emphasis) and Old World Desert (plants primarily from the drier regions of southern Africa), Coastal Sage Scrub, Sub-Tropical Fruit, a Pinetum, a Palm Canyon, as well as geographical collections for Africa, Australia (many familiar California landscape plants originally came from the drier sections of southwest Australia), Arid Madagascar, Arid South America, the Canary Islands, Cape South Africa, Central America, the Himalayas, the Mediterranean, the Middle East, New Zealand, the Pan-Tropical Rainforest with a 60-foot waterfall, and the Pacific. There is also a California Natives section, which highlights the landscape potential of these natives. Paths wind through a cluster of maturing cork oak (Quercus suber) trees whose bark has been used for making corks for thousands of years. The Bamboo Display Garden hosts the largest bamboo collection in the United States, featuring a variety of bamboo native to Asia, Africa, North and South America. 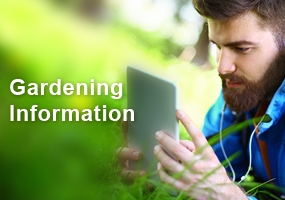 The Herb Garden features medicinal and culinary herbs, roses, perennials, grasses and flowers. The Hamilton Children’s Garden was opened in June 2011, the largest interactive children’s garden on the West Coast. Pond in the Pan-Tropical Rainforest (L), looking up the trunks of the dragon trees (Dracaena draco) in the Canary Islands Garden (C) and banana trees in the Sub-Tropical Fruit Garden (R). In eastern SD county, the 6 acre Water Conservation Garden at this small college has been designed to teach about xeriscape-type landscaping, which is well-suited for San Diego’s climate. A series of displays have been placed along three pedestrian path loops off a central outdoor entry lobby. There is also a native butterfly pavilion that is open in spring and summer. Educational exhibits feature plants from five different areas of the world with climates similar to San Diego’s (California, South Africa, Australia, Chile, and the Mediterranean) and demonstrate techniques and materials, and in some cases compare plant cultivars. The entrance to The Garden at Cuyamaca College (L), one of the three loops explaining the seven xeriscape principles, each whimsically represented by a 12-foot icon – here the Maintenance loop with giant shears (LC), and displays of container gardens (RC) and drought tolerant plantings (R). The courtyard of Mission San Diego de Alcala has a nice, small garden, and the entire grounds are planted with interesting plants. The aloes along the face of the church are particularly spectacular in winter, when in bloom. The San Diego Mission has nice plantings in front (L) and a small garden in the courtyard (C, R). Gardens aren’t the only place to see flowers. One of the most impressive displays occurs each spring in East County’s 600,000-acre Anza-Borrego Desert State Park, particularly after heavy seasonal rains. It’s an unforgettable sight if you’re lucky enough to catch the desert when it explodes into color with drifts of lavender desert sand verbena (Abronia villosa), white dune evening primrose (Oenothera deltoides) and other annual herbaceous wildflowers. The Anza Borrego Desert in bloom (L) with desert sand verbena (LC), desert poppy, Eschscholzia parishii (RC) and dune evening primrose (L). Somewhat less dependent on heavy rain are the brilliant reds, yellows, pinks and oranges of the ocotillo (Fouquieria splendens) and many cacti including beavertail (Opuntia basilaris), barrel (Ferocactus spp. ), and fishhook (Mammillaria microcarpa). Some of the many species of cactus in Anza-Borrego Desert State Park include beavertail (L), fishhook (LC), prickly pear, Opuntia sp. (RC), and barrel cactus (R). The peak of wildflower bloom at here is typically mid-March, lasting two to six weeks, but this can vary considerably each year. The types and amounts of flowers also vary quite a bit from year to year, depending on winter rainfall, spring temperatures and the amount of wind. 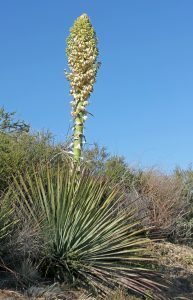 Visit the Anza-Borrego Desert State Park website or the Desert Wildflower Updates website to find out when peak bloom is expected, or call the Wildflower Hotline at (760) 767-4684. Yellow flowers and bluish foliage of brittlebush, Encelia farinosa (L); ocotillo blooming scarlet in the desert (LC); deep pink flowers of Bigelow’s monkeyflower, Mimulus bigelovii, below cholla (C); desert dandelion, Malacothrix glabrata (RC); and red flowers of chuparosa, Beloperone (=Justica) californica (R). Even if you miss the wildflowers, visit the Park any time of the year to see interesting native plants (yes, it’s hot in the summer, but it’s a dry heat…just drink lots of water, avoid hiking in mid-day, and enjoy the solitude). Of course there are numerous cacti – an especially good spot to see many species is the Cactus Loop Trail near the Tamarisk Grove Campground. At Borrego Palm Canyon, an easy 3-mile trail leads to a grove of native California fan palms (Washingtonia filifera) around a natural spring-fed oasis. And for hard-core succulent enthusiasts, brave the rugged road to the Elephant Trees Trail and take the 1.5-mile loop walk to see the northernmost population of Bursera microphylla (elephant tree), a genus of tropical America found in a few isolated canyons of San Diego county. Backlit cholla cactus, Opuntia sp., on the Cactus Loop Trail (L), blooming century plant, Agave americana (C), and the native California fan palm oasis in Borrego Palm Canyon (R).